How many demo applications am I allowed to create? Do applications shared with me decrease the number of demo applications I can create? What happens if my application is not used for a long time? does it get idled? What happens to my application’s data in case of a major failure event? How do I report bugs to the Wakanda Cloud team? What version of Wakanda is used on the Wakanda Cloud service? How do I report a feature request to Wakanda Cloud? Do I have access to Wakanda’s default administration solution? Can I use web-sockets in the application I deploy to the cloud? Are my solution’s configuration settings overwritten when I deploy my application to the cloud? Are automatic backups enabled by default when I buy a new application? 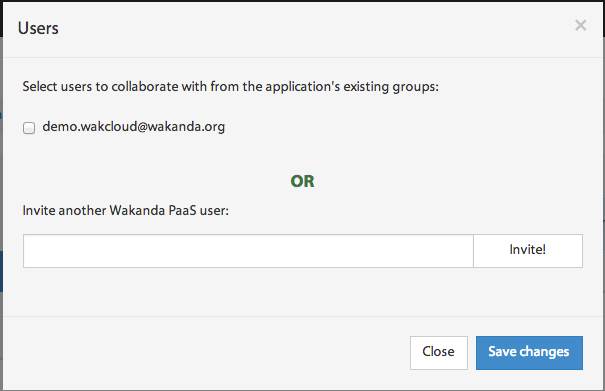 Could I invite someone who does not have a Wakanda Cloud account to my application? Could I associate several Wakanda Cloud accounts with a single Paypal account? Is VAT applied to my purchases? Why set the VAT ID? How am I billed for my application for the first time? How do the recurring billing work? The main view of the console gives you access to the list of your own and shared applications. Each row in the list describes the region the application is created in as well as the offer type and the owner if the application is not yours. it also includes quick action buttons to preview the app, delete it or get its detailed view. When you select an application from the list, a control panel with different views appears. The general view gives you real-time statistics of the memory and disk space usage. This view also provides a control panel to manage your app, as well as a log of the most recent operations performed. You can access the control panel to manage the state of your remote application. You can do one of the three following actions: start,stop or reload the application. The summary block displays information regarding memory’s and disk space’s current usage. It also provides a quick shortcut to the Git repository associated to your app and the version of your application’s wakanda server. This summary will help you make the correct decisions about scaling either up or down your application. The recent actions you or your collaborators have executed (update permissions, publish app, ...) are displayed in this view. The monitoring view allows you to monitor the activity of your application, by charting the usage statistics of memory, storage and network throughput. You can also hide or show your selected metrics from the graph by clicking on the control button. The x button allows you to delete the graph from the monitoring view. Wakanda Cloud allows you to bind your custom domains to your cloud applications. The custom domain will be automatically added to the list of your application’s custom domains. The permissions view offers you a way to work in a collaborative mode by creating groups, inviting users and managing their permissions. The Owner group is created automatically with every application. The only user it contains is the application’s owner. Set a name for the group. Type the emails of the collaborators in the Add users section. 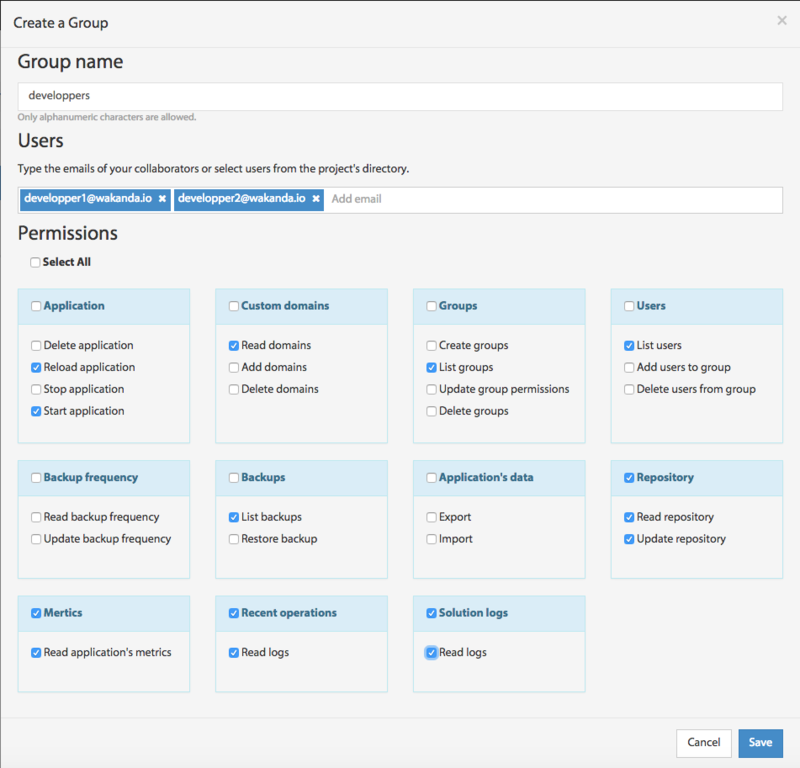 Set custom permissions for the group. On the users panel, you can add or remove collaborators from a selected group. To add a new user to a group, click on the Manage Users button or on the Add users to the group link if the group does not contain any users yet. Type in the user’s email and click on Invite or, if the user is also a collaborator in one of your other groups, select him/her from the shown list. You can also delete a user from a group by clicking on the X button in the user panel or in the manage users view by deselecting him/her. You can configure group permissions by clicking on the button. A predefined list of permissions appears where you can select/deselect the permissions you want to attribute to the group and then save the changes. You delete a group by simply clicking on the X button next to the group name. You should delete all users in a group before deleting it. The database view allows you to manage your application’s data, from scheduling your backups to exporting your remote waData file. You can schedule, download and restore your backups in this view. To schedule a backup you simply have to set the frequency and the time you want to start your full backups. The frequency of the incremental backups depend on the choice you have made. Daily: a full backup of your application’s data will occur every day at the time you have specified. An incremental backup is executed every hour. This frequency is suitable for applications in which data is critical and requires a fine level of restore points. Weekly: a full backup of your application’s data will occur every week at the day and time you have specified. An incremental backup is executed once every 6 hours. This type of frequency is a good compromise between the uptime of your application and the restore points available. Monthly: a full backup of your application’s data will occur every month at the date and time you have specified. An incremental backup is executed every 24 hours. If the uptime of your application is something you care about, this frequency is most suited for your application. The full backup is only performed once a month and lets you have daily restore points. Each row contains information about the backup made at that point in time. It includes the date of the backup, its state, its type and the various actions that can be done on it (download backup file, restore it, or the download its verify report). You can easily manage your remote application’s data by importing and exporting your waData file in this view. To import your waData file to your remote application, you can drag and drop the waData file in the specified section or select it by clicking on Select File button. Once the waData file is selected, click on the Import Data button and your newly imported data will take effect. The logs view allows you to access your Wakanda Solution’s logs. The profile view allows you to manage your personal, billing and entreprise information.